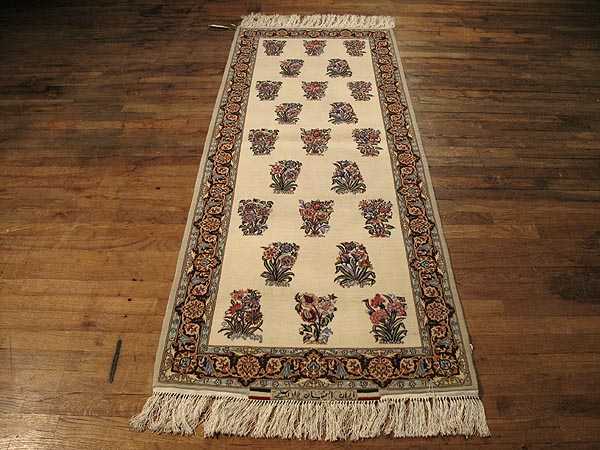 "This Persian rug's image is airy without rich decorations, but still very pleasant. It has an ivory background on top of which symmetrically arranged flower bouquets are applied. The colors are very natural, yet particularly intense being easy to be distinguished. The main border is colored with navy and contains floral ornaments. It frames this runner shape Persian rug field providing the idea of formalism. Palmette flowers and roses are painted in natural shades of red, pink and ivory and have slightly darker outlines."